INTRODUCTION: Androgen deprivation therapy (ADT) is known to adversely affect the quality of life (QoL). One may choose between surgical and medical forms depending on his economic status, education status, and taboos. The aim of this study was to assess the impact of medical versus surgical ADT on health-related quality of life (HRQoL) in patients with metastatic cancer prostate in Indian population. MATERIALS AND METHODS: From July 2012 to December 2014, 50 patients (10 medical castration and 40 surgical castration) of hormone-naïve metastatic prostate cancer who were started on combined ADT were included in this study. Before starting therapy, baseline data and QoL score (short form [SF-36] scale) were noted and all patients were followed up at 3 months, 6 months, and 1 year. Baseline data and HRQoL at all time intervals between surgical and medical castration groups were compared. RESULTS: All patients, except two, completed the 1-year follow-up period. Patients who opted for medical castration were more educated and belonged to higher socioeconomic status. For all the domains of SF-36 QoL questionnaire, a similar improvement in the score was noted at first 3-month follow-up which deteriorated in the next follow-up at 6 months and then further at 1 year. There was no difference in HRQoL after medical or surgical castration. CONCLUSIONS: In patients with metastatic cancer, prostate initiation of ADT, irrespective of method, causes an initial improvement in HRQoL followed later by a more gradual decline below the baseline. Although the reported incidence of prostatic carcinoma in India (6/100,000) is much lower than that in the United States of America (200/100,000), a larger percentage of patients present with metastatic disease due to lack of well-developed screening programs. These patients are usually started on androgen deprivation therapy (ADT) that is the standard of care. Unlike the usual chemotherapy, castration has a low-toxicity profile, good response rates, and prolongs survival. Although seemingly benign, ADT is known to cause multiple adverse effects on a males' health, where testosterone plays an important role in maintaining homeostasis. ADT is known to cause osteoporosis, hot flashes, erectile dysfunction and loss of libido, change in body habitus, cognitive dysfunction, diabetes and metabolic syndrome, cardiovascular morbidity/mortality, anemia, gynecomastia, etc., all of which adversely affect the QoL of a cancer patient. The WHO defined health as a state of complete physical, mental, and social well-being and not merely the absence of disease or infirmity. Thus, the reporting of outcomes in the usual terms of morbidity and mortality alone for chronic diseases such as cancer prostate underestimates the disease burden in the society. These patients suffer from the disease as well as its treatment and are unable to fulfill their social role. To obtain a holistic picture of the impact of such diseases in the society, one has to take health-related quality of life (HRQoL) into account. HRQoL is a patient-reported outcome that consists of a number of components such as functional status, psychological and social functioning, cognition, and disease/treatment-related symptoms and is a direct measure of the effect of the disease and its treatment on the patients' health. HRQoL is measured with surveys called as instruments that can be categorized into—general instruments or disease-specific instruments. General instruments are applicable to all the patients, regardless of their underlying disease and focuses on general health perception, sense of overall well-being, and function in various domains such as physical and mental. Most commonly used general HRQoL instrument is the RAND 36-item short form health survey (SF-36) that assess eight domain scales: physical functioning, role-physical, bodily pain, general health, vitality, social functioning, role emotional, and mental health. It further clubs these into two summary scales that is physical and mental composite scores and gives the ability to assess, which function is affected the most. The SF-36 has been extensively tested for reliability and validity.,, Other general HRQoL instruments are the SF-12 (abbreviated version of SF-36), quality of well-being (QWB) scale, and the sickness impact profile (SIP). Disease-specific instruments can be for malignancy in general, for example, EORTC QLQ-C30 (European Organization for the Research and Treatment of Cancer Quality of Life Questionnaire European Organization for the Research and Treatment of Cancer Quality of Life Questionnaire) or FACT (functional assessment of cancer therapy) or can even be cancer specific, for example, specific for cancer prostate: UCLA-PCI (University of California Los Angeles Prostate Cancer Index) but such scales are seldom used. Both disease progression and ADT are known to adversely affect the HRQoL in metastatic prostate cancer patients. Alibhai et al. evaluated physical function and HRQoL using the SF-36 in men with localized prostate cancer on ADT and compared it to men with prostate cancer, not on ADT and a healthy age-matched control group. They observed a significant decline in measures of physical function as well as in HRQoL but did not assess whether the androgen deprivation was medical or surgical. In developing country like India, medical ADT has cost implications and forces most patients to opt for surgical castration, which despite the mutilation and its associated psychological effects, is an economical option. Furthermore, not much importance is given to the effects on QoL while choosing among the various treatment options. The aim of this study was to assess the impact of ADT on HRQoL among metastatic cancer prostate patients in Indian population and to observe the difference between medical versus surgical ADT if any. After Institutional Board Review and Ethical Clearance (IEC/2012-3-231), we prospectively included 50 patients who were diagnosed with metastatic cancer prostate on standard evaluation and were planned for primary androgen therapy at our center from July 2012 to December 2014. Patients who were nonambulatory or paraplegic, received local radiotherapy, or did not consent for the study were excluded from the study. According to our institute's protocol, patients were started on combined androgen blockade comprising either medical or surgical castration along with antiandrogen (bicalutamide 50 mg/day). All patients were explained about medical and surgical ADT options and 10 patients chose medical therapy and the rest 40 opted for bilateral orchidectomy. Before starting the treatment, baseline data regarding patient's disease status, comorbidities, and educational and socioeconomic status were as recorded. Socioeconomic status was recorded according to Modified BG Prasad's scale 2013 and comorbidities according to Charlson's comorbidity index. QoL score (SF-36 scale) questionnaire was given to patients in before starting ADT, and the final score was calculated from website-sf36.org.com. Score consists of eight domains—physical function (PF), role physical (RP), body pain (BP), general health (GH), vitality (VT), social function (SF), role emotion (RE), and mental health (MH) and also two composite scores—physical composite score (PCS) and mental composite score (MCS). PCS depends on PF, RP, BP, and GH. MCS depends on VT, SF, RE, and MH. All patients were followed up at 3 monthly intervals for up to 1 year, and at each visit, the disease status was noted, and SF-36 questionnaire was filled. 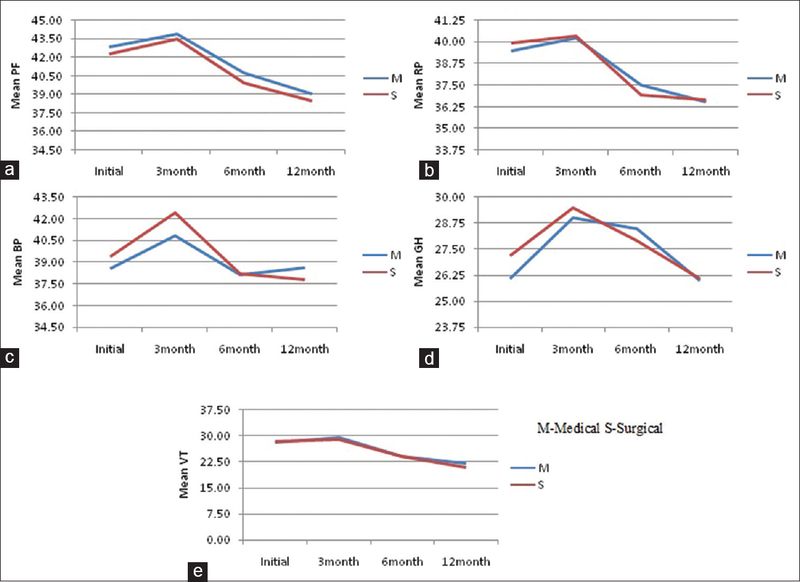 Mann–Whitney test was used to compare the groups (medical and surgical ADT), and HRQoL scores between two arms were compared using Wilcoxon test using SPSS for Windows, Version 15.0. Chicago, SPSS Inc.
Of 50 patients, 40 patients opted for surgical castration (group A) and 10 patients were given LHRH agonist (medical castration—group B). 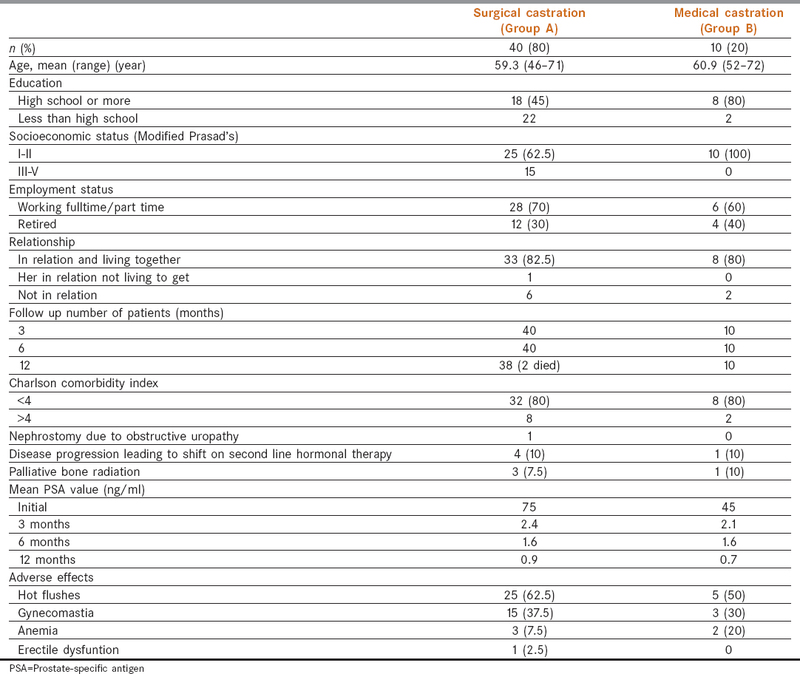 Patient profile and baseline characteristics of patients in both the groups are showned in [Table 1]. Except for the education and socioeconomic status, all other factors were comparable between the two groups. Patients with higher education status and socioeconomic status opted for medical management (high school or more 80% in group B vs 45% in group A, modified Prasad groups I and II 100% in group B vs 62.5% in group A). One patient in group A developed supravesical obstruction requiring temporary nephrostomy tubes for azotemia (serum creatinine 2.0 mg%) that resolved with treatment. All patients, except two in group A, completed 1 year of follow-up. Of the noted adverse effects, hot flushes and gynecomastia were more common in surgical group, whereas anemia was more prevalent in medical group. One patient in surgical group had new onset erectile dysfunction. 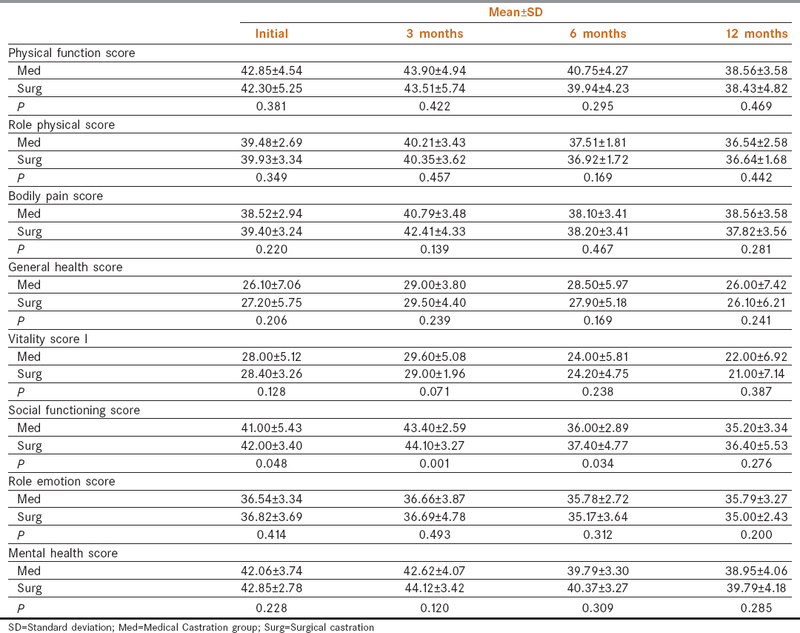 HRQoL was measured using SF-36 score at baseline, 3, 6, and 12 months. 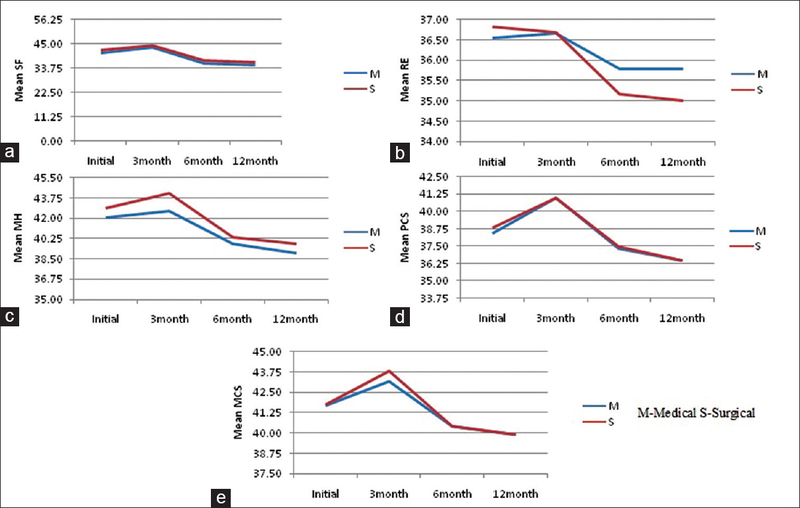 For all the domain as well as composite scores, there was an initial improvement in HRQoL at 3 months after initiating ADT as compared to baseline, which then deteriorated over the next 9 months of follow-up. On comparing the initial score with 12-month scores, physical function, role physical, social functioning, vitality, mental health, and physical composite score showed a decline. In the rest of the four domains, the score remained stable. There was no difference in HRQoL scores between the surgical and medical groups at any time interval of follow-up. The results and comparison of eight domain scores are summarized in [Table 2] and that of the two composite scores in [Table 3] and [Figure 1], [Figure 2]. In this study, we analyzed the effect of ADT on HRQoL in patients with metastatic carcinoma prostate. All included patients were recently diagnosed and hormone naïve to begin with and started on combined androgen therapy. Method of androgen deprivation, whether medical or surgical, was patients' choice. We observed that, after initiation of ADT, there is an initial improvement in all the domains of health score indicating a sense of general, physical, and emotional well-being. However, this improvement is short lived and returned to baseline at 6 months and then progressively declines below it. There is no difference in QoL among those treated medically or surgically. QoL has become a major factor while choosing therapeutic option among patients of prostate cancer in the West. This is especially true for localized cancer prostate where the side effect profile and QoL after surgery and radiotherapy are often compared to that of ADT. Most of the studies are conducted in patients with localized cancer prostate patients, and it has been shown that treatment with ADT has a deleterious effect on HRQoL, which starts declining immediately after initiation of therapy.,, Alibhai et al. showed that in patients with localized cancer prostate, ADT users had adverse HRQoL immediately after initiation of ADT at 3-month interval as compared with prostate cancer controls and healthy controls in most of domains, specially physical function. Declines in HRQoL were noted at first assessment made at 3 months and then either remained stable or had smaller declines thereafter for the period of 1 year of their study. Similarly, Potosky et al., studied patients with localized cancer prostate on ADT compared to those on observation and demonstrated lower physical function, vitality scores. However, they did not collect baseline data and compared HRQoL at 6 and 12 months after initialing ADT. We noted an initial improvement in all the domains followed by a more gradual decline that could be explained by the fact that we included patients with metastatic disease. Initiation of ADT will have caused apoptosis and reduced the tumor burden leading to a generalized sense of well-being and energy after the initiation of the treatment. Another explanation could be the psychological impact of being diagnosed with metastatic cancer prostate that leads to poor HRQoL scores at the initial assessment. When patient is started on ADT and followed up with serum prostate-specific antigen at 3 months that shows a decline, the feeling of winning the battle against cancer may lead to high HRQoL score, which later decline at 6 months and then either falls gradually or remain almost stable. We observed no difference in HRQoL among medically and surgically castrated patients. Similar findings have been reported in the literature.,, This implies that testosterone levels in the body rather than method of castration causes the adverse effects on HRQoL associated with ADT. In the current study, all patients were given the option of either medical or surgical castration and most (80%) opted for the latter. Foremost reason for the same is the high cost of medical ADT. Nygård et al. performed the cost analysis between medical ADT and surgical ADT and found treatment costs per patient was 8,895 pounds for orchiectomy and 10,937 pounds for LHRH analogue (medical castration), with the crossover in cost located at 25 months and concluded that surgical castration should be the treatment of choice when life expectancy is more than two 2 years. This is contrary to our setup where surgical castration is way cheap right from the initiation of therapy because it is government funded as compared to LHRH analogues that patient has to procure. This study has certain limitations. First, the sample size of patients included and that of those who underwent medical castration is limited. A larger group would have better elicited the difference between medical and surgical castration arms, if any. Second, we have not included lower urinary tract symptoms and effect of ADT on erectile function that significantly affect the patients' life. Although most patients who were included were hormone naïve, we have not taken into account the disease progression and hormone refractory state that could have adversely affected the HRQoL scores on follow-up visits. Another limitation is the short follow-up, and Finally, we used a general score that is SF-36, which is not cancer prostate-specific instrument to measure the QoL. In patients with metastatic cancer prostate, ADT adversely affects the HRQoL. After a brief period of improvement, a decline below the baseline is noted in physical and social functioning of patients on ADT at 1 year of follow-up. There is no difference in medical versus surgical castration as far as HRQoL is concerned, and this choice can be left to the patient. Bill-Axelson A, Holmberg L, Ruutu M, Garmo H, Stark JR, Busch C, et al. Radical prostatectomy versus watchful waiting in early prostate cancer. N Engl J Med 2011;364:1708-17. McHorney CA, Ware JE Jr., Raczek AE. The MOS 36-item short-form health survey (SF-36): II. Psychometric and clinical tests of validity in measuring physical and mental health constructs. Med Care 1993;31:247-63. Ware JE Jr., Kosinski M, Keller SD. SF-36 Physical and Mental Health Summary Scales: A User's Manual. Boston, MA: The Health Institute; 1994. Alibhai SM, Gogov S, Allibhai Z. Long-term side effects of androgen deprivation therapy in men with non-metastatic prostate cancer: A systematic literature review. Crit Rev Oncol Hematol 2006;60:201-15. Reddy S, Arlappa N. An Updated Prasad's Socio Economic Status Classification for 2013. Int J Res Dev Health 2013;1:26-28. Sadetsky N, Greene K, Cooperberg MR, Hubbard A, Carroll PR, Satariano W, et al. Impact of androgen deprivation on physical well-being in patients with prostate cancer: Analysis from the caPSURE (Cancer of the prostate strategic urologic research endeavor) registry. Cancer 2011;117:4406-13. Litwin MS, Shpall AI, Dorey F, Nguyen TH. Quality-of-life outcomes in long-term survivors of advanced prostate cancer. Am J Clin Oncol 1998;21:327-32. Potosky AL, Knopf K, Clegg LX, Abertsen PC, Stanford JL, Hemilton AS. Quality of life after primary ADT: Results from prostate cancer outcomes study. J Clin Oncol 2001;19:3750-7. Nygård R, Norum J, Due J. Goserelin (Zoladex) or orchiectomy in metastatic prostate cancer? A quality of life and cost-effectiveness analysis. Anticancer Res 2001;21:781-8.